Join me on an Everglades fly-fishing adventure. From our jumping-off point in Chokoloskee on Florida’s Beautiful southwest coast, we’ll prowl the shallow Gulf-side flats that border the western Everglades and Ten Thousand Islands or plunge deep into the heart of the Everglades back-country in search of the Big Three of the flats: snook, redfish and tarpon. Wherever we go, we’ll be poling in shallow water – sometimes with only inches to spare between the hull of the boat and the bottom – looking for the predator fish that roam the same flats. Sight-fishing like this is exciting and demanding, requiring stealth, teamwork between angler and guide, careful presentation of fly or lure, and once you hook up, the ability to fight and subdue a powerful adversary. We’ll be fishing out of a high-tech Maverick HPX-T flats skiff. I supply G. Loomis rods and Tibor reels along with all necessary licenses, flies, leaders… plus the patience to help you master this challenging form of angling. Half-day, full-day and evening trips are offered. Chokoloskee is within easy driving distance of Naples, Bonita Springs and Fort Myers. It’s ideally located at the western entrance to the Everglades National Park. 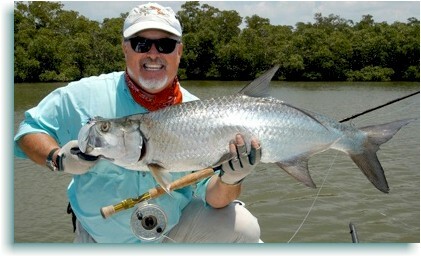 This entry was posted in Fly Fishing Guides, Southeast saltwater. Bookmark the permalink.